Chef Frida Johansson, the Executive Chef to the Ambassador of Sweden to the U.S., makes holiday saffron buns. The life of an embassy chef is a busy one. 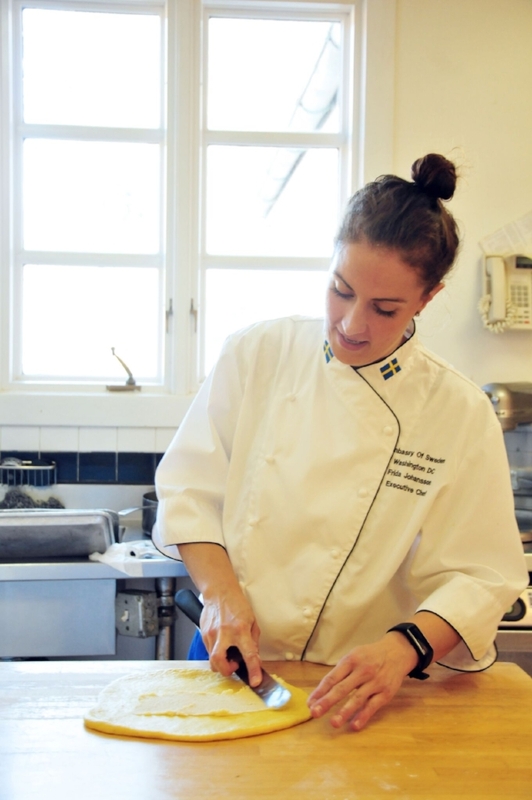 Just ask Chef Frida Johansson, the Executive Chef to the Ambassador of Sweden to the United States. We meet Frida where she spends her working hours: the kitchen in the residence of Ambassador Karin Olofsdotter, Sweden’s first female ambassador to the United States. Even in mid-October, Frida was already well underway with plans for her biggest party of the year, the St. Lucia’s Day celebration held at House of Sweden in Georgetown. And since Chef Frida has raised the bar on herself for this already popular event, she is committed to making each year even more magical and exciting than the ones before. Equally unexpected was her journey to the Embassy and the United States. Frida worked abroad after graduation, including a stint cooking in New Zealand. She returned home to Sweden for a month, only to be involved in a near-fatal car accident which required extensive recovery, waylaying other plans. Frida’s saffron buns make for an excellent shareable dessert. Your journey to the world’s most delicious saffron buns starts the day before you actually put them in the oven by letting the saffron infuse the milk you will use in the sponge. This is my take on a traditional holiday bun that everybody makes at home and you will love it. Our cuisine has been very influenced by international trade for centuries, so that is why you will see spices from the Silk Road and Asia in our food like saffron, cardamom, ginger, and cinnamon. Start with ¼ cup of milk, warming it gently without reaching a simmer. Add the saffron and let it infuse the milk for about 15 minutes. Then add the rest of the milk and put it in the fridge overnight, or for at least 12 hours. The next day, warm up the milk to body temperature and dissolve the yeast into it. Add the flour and mix. Once it comes together, knead the dough for 5 minutes. Let it rest, covered by a dish towel, for about 15–20 minutes. If you are mixing with a stand mixer, you will want to use the dough hook for this. If you are mixing by hand, consider this recipe to be your cardio for the day! Once the sponge has rested, add the ingredients listed under the “dough” section: butter, sugar, salt and more flour. Knead or mix until the dough is smooth, glossy and starts to release any hard edges. If you are kneading by hand, just keeping kneading until you can’t do it anymore! Let the dough rest under a dish towel again for about 20–30 minutes. While the dough rests, prepare the filling. Mix the almond paste with sugar and vanilla sugar. Add the butter gradually until you have a smooth and fully combined filling. Don’t forget that the butter needs to be room temperature. Roll out the dough in a large rectangle on a lightly floured surface. It should be about 18 by 27 inches, and about .2 inch thick (half a centimeter). That’s about the size of a full-size sheet pan, for reference. Spread the filling evenly over the dough, all the way to the edges. Now it’s time to knot your saffron buns. Step one: Looking at the rectangle of dough and filling in front of you, grasp the top edge of the dough and fold it toward you, so that you have a long, skinny rectangle in front of you. Try to fold it as smoothly as you can, with the edges from the top layer of dough matching the edges on the bottom. Step two: Cut the folded dough into long skinny strands about 1½ inches wide. You can cut the strips with a knife, a pizza cutter or scissors. Step three: Imagine you’re playing rock, paper, scissors. Make the “scissors” with your non-dominant hand, and then wrap a strand of dough around your 2 fingers twice. Then tie the dough into a loose knot by wrapping the dough around the middle of the loops you just created and tucking the middle into a loop. Overall, this action will remind you of wrapping up a pair of headphones. Wrap the strips of dough around two of your fingers as though they were a pair of headphones. Repeat with the rest of your dough pieces, placing each knot onto a baking sheet lined with parchment paper. Once you’ve finished making all of your knots, cover the buns with a dish towel and let them rise for about 1–2 hours. Now that your buns have risen, beat the egg with the water and salt to make an egg wash and brush each bun with it. Sprinkle the sliced almonds and pearl sugar over the buns. Bake 13–15 minutes, or until your saffron buns are golden brown. Alternately, bake without the topping, let cool, then brush with melted butter and dip in sugar.